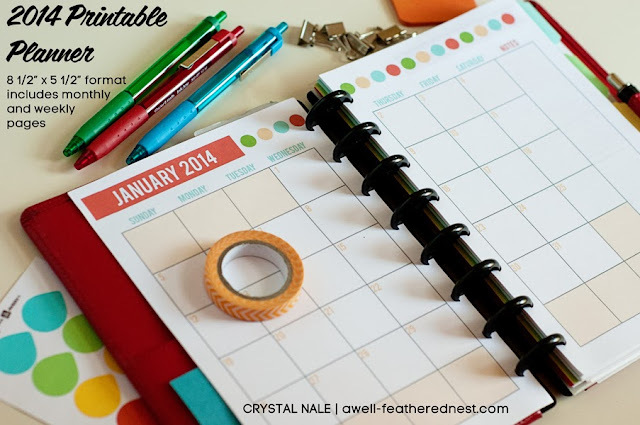 A Well-Feathered Nest: The 2014 Printable Planner Comes in a New Size! 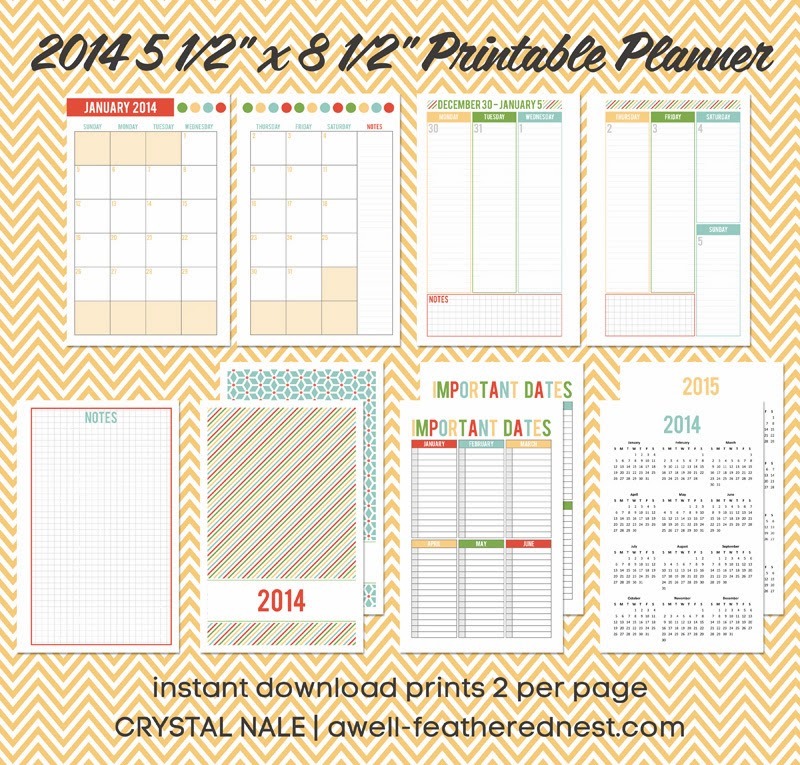 The 2014 Printable Planner Comes in a New Size! 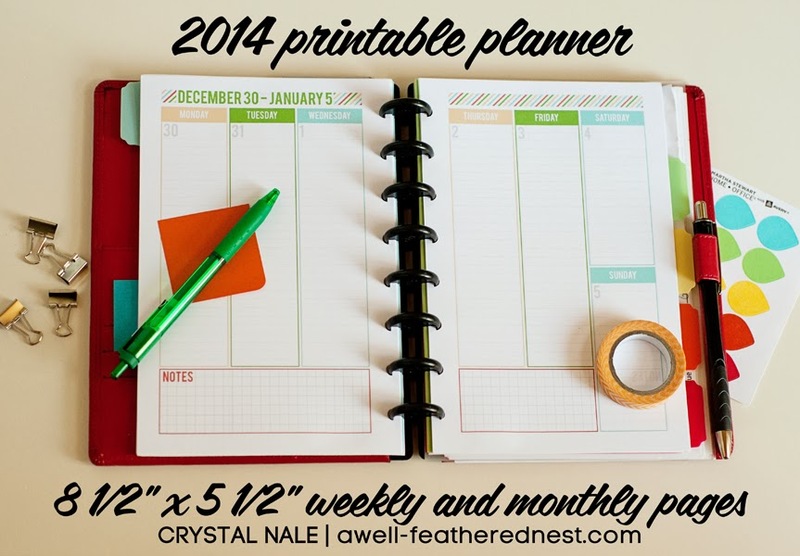 Getting my printable planners updated for 2014 has been painfully slow for a lot of reasons. Most of them boil down to lack of time. That's why I'm so excited to finally have a new format up in my shop! The others should follow soon. I received several requests over the last year for a smaller format planner, and I really wanted this size for my own personal use once I had some of the design features worked out in last year's versions. The trick was figuring out just how to put the files together to make it easy for people to print on both sides of their paper at home and still have it all line up just right. My brain doesn't naturally work that way, so it took some trial and error (and I changed methods in the middle a few times). I think I've found a method that makes it pretty simple to print AND allows you to print only a portion of the pages at a time if you wish. The instructions are included with the PDF files! I've been using this planner for several months now, and I LOVE it. That may also have a little bit to do with the how I've put it all together, and I'll share that with you all in the very near future. Monthly Pages - Each monthly calendar prints across two half-sized pages to give you ample space to record all your important information. Weekly pages - The Monday through Sunday weekly spreads include spacious daily blocks, a place for notes, and lines to keep everything neat as you write. Covers - The striped and blue flower designs are included for you to print front and back covers if you wish. Print these on card stock and laminate them for durability. Important Dates - These pages will print with six months on the front and six months on the back when the sheets are trimmed. Record all of your important dates that never change in one spot. One-Year Calendars - These pages print front and back when trimmed and give you a year at-a-glance for 2014 and 2015. Notes Grid - This page is a great extra to slip in wherever you need some extra space to write! Bonus Pages - Planner pages for the remainder of 2013 are included, so you can put together your personalized planner and begin using it today!